Compressed Air Consumption 6-8 kg/cm sq. 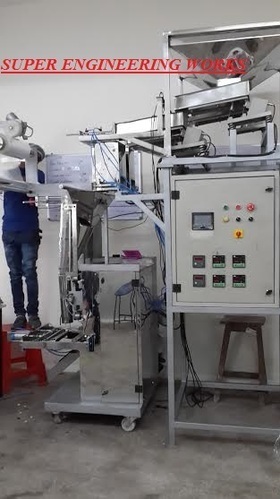 Packing Machine with Weight System, Automatic Packaging Machines, are used to pack powders & granules such as tea, coffee, , spices, rice, pulses, hina powder, milk powder, nuts, dry fruits, wheat flour, besan, maida, namkeens, snack food , biscuits etc. Established in the year 2003, at Noida (Uttar Pradesh, India), we “Super Engineering Works” are reputed Manufacturer of Granules Packing Machines, Powder Packaging Machines, Liquid Packaging Machines, Chips Packaging Machine and more. These machines are manufactured and designed with high precision using the best grade components and advanced technology in order to meet the set industrial standards. The offered machines are widely acknowledged among our prestigious clients due to their excellent performance, low maintenance, sturdy construction, high efficiency and longer service life. Furthermore, we offer these products to our esteemed clients in various technical specifications at an affordable price range. We have developed a state-of-the-art infrastructural base divided into departments such as procuring, manufacturing, quality testing, sales & marketing, etc. All these departments are resourced with the latest machinery and advanced technology in order to timely meet the large-scale orders of customers. The installed machines and tools regularly oiled and updated to attain high efficiency and quality in the manufacturing process. Our team of adroit professionals supervises the activities of these departments to make sure the production and delivery of a flawless assortment of machines at client’s end. We have selected a responsible team of industry experts, which empowers us to stay ahead of other competitors. Our proficient team members work in the most coherent manner with each other in order to manufacture a high performing range of machines in accordance with international quality standards. By utilizing the vast industry experience and skills, our professionals implement the advanced methodologies to manufacture highly durable and customized products. Apart from this, we organize frequent training programs and seminars for our team in order to update their knowledge & skills. Being a quality centric organization, the entire manufacturing process is monitored and supervised by our expert quality analysts, who have an in-depth knowledge in this domain The entire product range is also tested on set quality standards. Our aim is to give a high performance range of products to our esteemed clients Moreover, we have selected a team of quality controllers, who work round the clock in order to make sure that the given array of products conforms to the international quality standards. With rich industry experience and knowledge, we have understood the importance of clients. With our ethical business practices and competitive pricing policy, we have gained a huge client base across the nation. We also accept payments through easy modes like cash, cheque and DD for clients' convenience and provide them optimum satisfaction.